The Wolf Chronicles trilogy is the story of why wolves and humans can never be friends. Or why they MUST be friends. Actually, I am not sure of anything. If there is one thing at which Hearst excels, it is Being Mysterious. 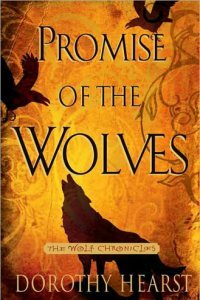 'Promise of the Wolves'; NYC, Simon & Schuster, June 2008, hardcover $25 (341 pages), paperback $11, Kindle $11.99. 'Secrets of the Wolves'; NYC, Simon & Schuster, August 2011, hardcover $24.00 (371 pages), Kindle $10.99. The narrator, and protagonist of the trilogy, is Kaala Smallteeth, a cub born into the Swift River wolf pack of the Wide Valley; a rich land of five packs of wolves, several tribes of men, and untold numbers of other predators and prey animals. Kaala’s mother had mated with an Outsider wolf, which is why Swift River pack leader Ruuqo has come to kill her cubs. But the Greatwolves have received a message (from whom?) that Kaala will bring great fortune or great misfortune to all wolves, so they must let her live until they can learn which it is. The novel is Kaala’s autobiography. The reader learns about life among the wolves in the Swift River pack, and by implication all wolf packs, as she grows from cubhood into a littlewolf, then a yearling youngwolf. Maybe raven won’t catch you. This hinting at mysteries goes on throughout, because Kaala is constantly reminded of her supernatural heritage. Who was her Outsider father, and how did her mother meet him? Who is the lupine ghost who comes to her in dreams? Well, that one is obvious right away; it’s Lydda from 40,000 years ago. Why won’t anyone answer Kaala’s frequent questions? ‘Why not?’ I asked [Ruuqo]. How can all the signs urge Kaala to go to the humans if this is bad? The pull is finally too great; also, Kaala gets tired of being snubbed. Kaala (followed by Ázzuen and Maara) sneaks into a human camp and befriends the girl, TaLi, and her boyfriend, BreLan. What happens in the final 100+ pages of Promise of the Wolves tells the Very Dramatic result of that. But it is not really a conclusion, because this is only the first Book of the trilogy. Secrets of the Wolves continues Kaala’s story. She, and Ázzuen and Marra, have been driven out of the Wide Valley, but they must return and get the Valley’s wolves and humans to live in friendship. The Greatwolves impose an additional condition. The three youngwolves “who at nine and a half moons old were not yet quite considered adults” (p. 13), plus Tlitoo the raven, are eager to be the wolves’ ambassadors, to the outrage of the older wolves who are sure that they are too immature for such an important mission. But the Greatwolves demand that ALL the Swift River pack go to live with the humans. This worries the youngwolves, who feel sure that the adults are too hidebound to live with humans peaceably. A more troubling concern is that the wolves must remain equal partners with the humans. Since the reader knows that prehistoric wolves who became domesticated did in fact evolve into tamed dogs, it seems that Maara and her companions cannot win without failing. In this middle book, the main question is whether the Wide Valley wolves will come to successfully live with the humans or not. In a subplot, a strange wolf, Demmen, appears who claims to be an envoy from Maara’s exiled mother. Can Demmen be trusted? Will extremists among the Greatwolves sabotage the Swift River wolves’ attempt to live with the humans? What is the real reason that ravens live in partnership with wolves? Secrets of the Wolves introduces dramatic new mysteries. Everyone is keeping secrets from everyone else. Each group has two factions; the Greatwolves, the smallwolves, the humans, and the ravens, all trying to win allies and betray enemies. Some of the mysteries are exasperating because they seem to be unnecessary; just for the sake of being mysterious. But there is plenty here to keep the reader captivated. 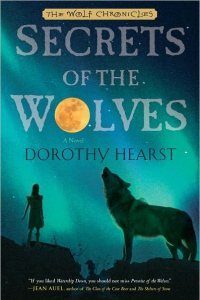 Dorothy Hearst says in her blog that she is racing to get The Wolf Chronicles Book 3 written. You're buying the words, not the paper, so it's more about convenience and release timing. Kindle editions tend to be available as soon as hardback editions are; they are almost instantly readable, and are arguably easier to carry around. Would the price fall if there were less of a monopoly? Probably, and it likely will in time, but you'll always pay for priority.